EDM fans rejoice! Winter is coming and it is bringing along some of the most awaited music festivals of the year. With jaw dropping techno beats to mind altering trance music, the scintillating stage presence of the world famous EDM artists will make sure that you’ll groove to their tunes till you drop dead. Here are the most awaited EDM festivals happening in November this year. Electric Daisy Carnival (EDC) Orlando is one of the biggest wintertime festivals in North America. Spanning over two days, this annual festival’s line up showcases some of the most popular names in EDM, house, and techno genre. Badklaat, Bassnectar, Bassrush Experience, G-Buck, and Illenium are few of the top performers among others who’ll be playing in the event. Apart from the music, you can also experience the Carnival Square which facilitates vivid carnival games and lots of mouthwatering snacks and eateries. There is also a provision to witness live dancers, stilters, aerialists, circus performers, and several vibrant art structures. The festival is taking place from 9th to 10th November at TINKER FIELD, South Tampa Ave, Orlando, FL 32805. Zen Awakening Fest is an annual transformational music and arts festival aimed for people who seek out spiritual awakening, consciousness elevation, and unconditional love and support among their peers. It is renowned throughout the country for showcasing Celebrity DJ’s, Jam Bands, Yoga and Meditation sessions, Spiritual Teachers, Holistic uplifting of consciousness, Cirque Performers, Flow Dancers, Group Chants, Fire Performers, Central Fire, and many engaging workshops. Yheti, Exit 9, Higher Learning, Ployd, Sonic Butterfly, Flow Sisters are some of the artists present in the lineup. Taking place at the Triple Canopy Ranch, FL, you’ll find yourself amidst lush green camping grounds and serene lakes making the whole atmosphere of the place rejuvenating. Dreamstate festival is the most sought after annual festival for trance music lovers. The kaleidoscopic audio-visual environment of the stages and exuberant synergy of trance melodies will surely elevate your consciousness into a higher dimension. The lineup includes the likes of Ace Ventura, Alex Di Stefano, Cold Blue, Cosmic Gates, Factor B, and many more. You can be rest assured to find all the modern amenities at the venue including Food and beverages, ATM s’, Washrooms, etc. Are you looking for a well-needed escape from a hectic festival season of December or a bitter and cold January month? Take a quick break to a nearby winter getaway and get recharged. 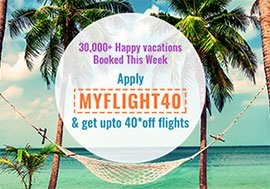 Check exciting deals on winter flight booking and grab the best deal on winter airline tickets for a perfect winter vacation with family and friends. Here are a few tips and tricks on how to find the cheapest winter flights. These simple tips can save a lot and enable you to have a budgeted yet a fun filled winter vacation with your loved ones. Start searching for the winter flights as soon as you plan your winter vacation. It is always beneficial to make the winter flight reservations as early as possible. Airlines generally release the tickets 11 months in advance. Once you know your winter getaway, start searching and continue to check at least once per week to grab the best deal on the winter airline tickets. It is important to understand when exactly one should buy the winter airline tickets. Though there is no hard and fast rule, however, there are some generic trends to be aware of when looking for a cheap winter flights. Peak season and holiday weekends will have the most demand, so expect higher prices during this time. Ideally 3-7 weeks in advance is recommended for a winter flight booking. Because of the dynamic pricing system, flight prices fluctuate constantly as per the supply and demand so the moment you come across a price which suits you and which you have in mind, just grab it. In addition to checking the major airline booking sites, check all possible air carriers, including the specific budget carriers for your planned travel destination and try flying the budget airlines. You might get hold of some cheap winter flights and save big. You need to keep in mind the best days to fly as few discounted winter flights can certainly be found depending on certain days you opt to fly. The general consent is that it’s best to fly out on a Tuesday, Wednesday or Saturday. These are a few not so busy days with airlines carrying fewer business travelers, which mean lower fares and a excess of seats. If you are lucky there is a fair chance of getting a frequent flyer seats on these days. Fridays and Sundays are usually the most expensive days to fly. Flexibility with your flight dates can save you a lot. If you look for exact dates, it will be more challenging to get the best deal. Allow yourself the best chance by searching a couple of days, or even weeks, either side of your preferred departure date. Adjust the time of day for flying. Flying at odd hours, such as the red-eye or early morning instead of late morning through afternoon, might increase your chance of getting the best deal. Mostly, the cheapest flights leave either very early in the morning or late at night. Check alternate or neighboring airports near your destination and compare the fare price before making your flight reservation. The more flexible you are in terms of your destination airports and your travel dates, the more likely you will be able to find the best deals on airfare. And consider multi-city flights or indirect flights to save big on your winter vacation travel expenses. Codesharing is also a great way to get a flight with an airline via another one at cheaper prices.